There is something so wonderful about getting your hands dirty in the early spring to turn the soil and prepare the garden beds for this years seeds. It is the work that pays off later when you yield an amazing crop of heirloom tomatoes! I knew with all of the tomatoes from my garden I had to make salsa. I found the secret to great salsa making is to marinate or pickle your onions in lime juice for the perfect acidity. I know you may have tried to make salsa before from an online source, but this isn’t just any recipe. It might not be a salsa recipe from deep in the heart of Mexico, but the 2 quarts this recipe made was gone from my fridge in a couple of days. 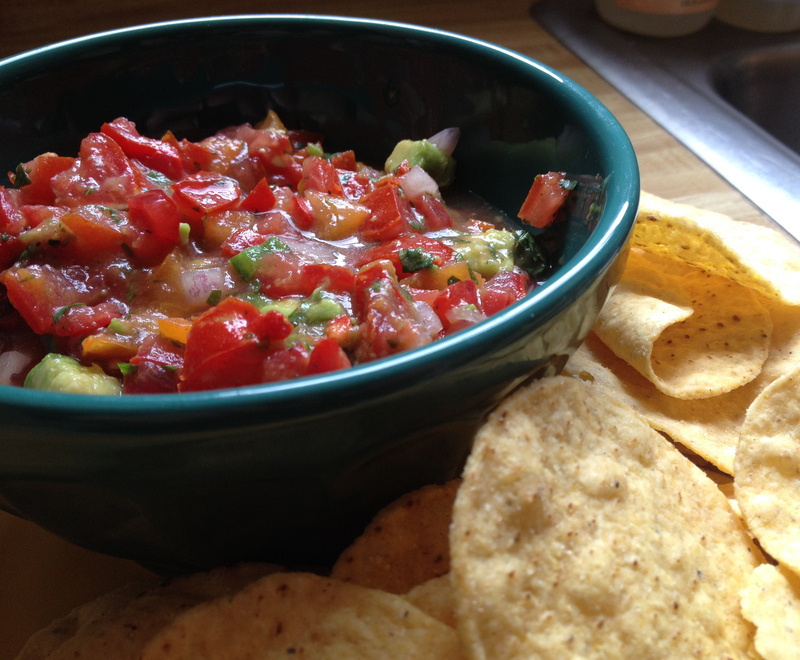 Once you make this salsa once you can change it to suit your tastes. If you like spicy salsa amp up the jalapeno peppers or leave the seeds in the mix. Have fun with it and don’t be afraid to take your own direction. I used two kinds of tomatoes to bring as many colors to my salsa as possible. Remember to pick the best quality tomatoes, if not from a home garden, from a farmers market near you. Unfortunately canned tomatoes won’t be the same as fresh in this particular recipe. 1. Combine the onions, lime juice, salt, and pepper in a non reactive bowl ie glass, stainless steel, plastic. Leave to sit while you prepare the rest of the ingredients. 2. Combine the other ingredients and add the onions to them, mix well and eat vigorously!